Sew Inspired: doll quilt finish--"Six of One"
p.s. 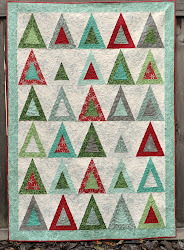 does anyone "get" the name of the quilt, or am I a huge dork and need to explain it? hermoso! what a lovely quilt! your swap partner will be happy with it! I totally get the name! I absolutely LOVE it! I love the colors and textures. You did an amazing job. I'm so excited to see the finished quilt. Your swap partner is a lucky girl. Six of One Half Dozen of the Other???? good name! it looks adorable. how will you part with it. Too cute! Can't wait for your tutorial! Very cute, and yes the name is clever! That's the cutest little thing! Great name and, no, you don't have to explain it! Thanks for sharing! oh darling! love the seedling chick, how adorable! i love the binding and the hand quilting, really all came together beautifully! Very cute! 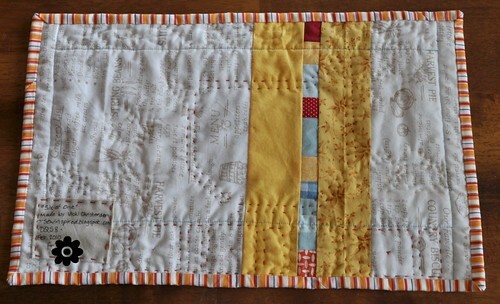 Your stitching is perfect with the quilt too! Great job. That is just the cutest. I love it. Chickens are my favorite. Adorable little quilt - wish I was the recipient! Love the colors. I'm slightly afraid of chickens, but it is still really cute. If you're a dork, I'm one, too!! It's good to have company here in dork-land! 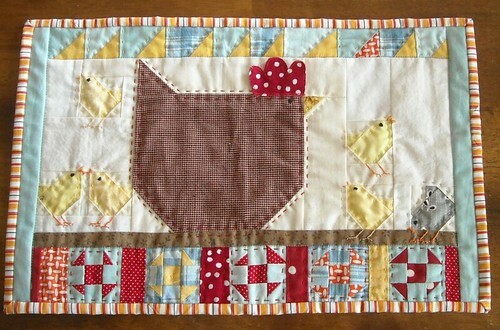 Your quilt is just the clucky-best thing! What a great job you did!! No one could look at it and not SMILE! That came out darling! Love it! this is so so adorable!! i love the two kissy chicks on the bottom left! i have a friend who would absolutely love this doll quilt! i wonder if it's for her? really really beautiful hand quilting and embroidery too! i really have to finish my DQS this weekend! i love that quilt! wow!!! It's absolutely adorable! I especially love the handquilting. Cute, cute, cute!! That is a wonderful wonderful swap quilt! oh good grief! This turned out so cute ! I love it all. Esp. the little blocks along the bottom! Great work!